Crises can test relationships, not unlike the way a hurricane stress-tests a ship at sea. If a vessel isn’t seaworthy, the leaks soon become obvious. So, too, the cordial business relationship between insurance agent and policyholder can face a serious test following a loss, particularly a catastrophic one. Selection of necessary coverage elements often is guided by knowledge but limited by availability, with education and expectations of coverage playing a role in how an agent and insurer will be perceived in the event of a loss. Certainly those dynamics were in play in the aftermath of Superstorm Sandy, which hit the coastal United States on October 29, 2012, with a devastating impact on many states, and especially along New Jersey’s populated shoreline. Sandy’s storm surge inundated coastal areas, smashing and washing away homes and commercial buildings. Much news coverage focused on flood insurance, lack of flood insurance, and government assistance programs. Hardening of infrastructure and modernization of building codes also generated headlines. Natural catastrophes tend to leave an indelible mark on the communities they touch, even though the resiliency of human nature invariably surfaces. There’s usually a resolve to mitigate potential impacts from future bouts of nature’s fury. And so it was following Sandy, with hard-hit New Jersey serving as an example and presenting issues that have universal application. Behind the headlines, a traditional (but perhaps unheralded) coverage was playing a role in helping some storm victims in the recovery. Ordinance or law coverage (OLC), sometimes in the form of an optional endorsement to a property policy, generally consists of three elements, all of which are subject to the prerequisite of physical damage by a covered peril. Contingent liability (known as Coverage A in endorsements offered by many commercial lines insurers) addresses loss in value of undamaged parts of a building in the event of required demolition of such parts, a scenario often referred to as constructive total loss. Demolition cost coverage (Coverage B) complements Coverage A by addressing the cost to demolish undamaged parts of a building. Increased cost of construction coverage (Coverage C) is designed to pay for costs of upgrading a new or repaired building to compliance with the applicable building code. As insurance products evolve to meet need and demand, we can anticipate enhancements to coverage offerings such as OLC, including, perhaps, providing coverage for the costs associated with certain aspects of post-loss building code changes. In part, local building codes may incorporate various requirements in response to federal and state mandates. Floodplain ordinances serve as a good example. 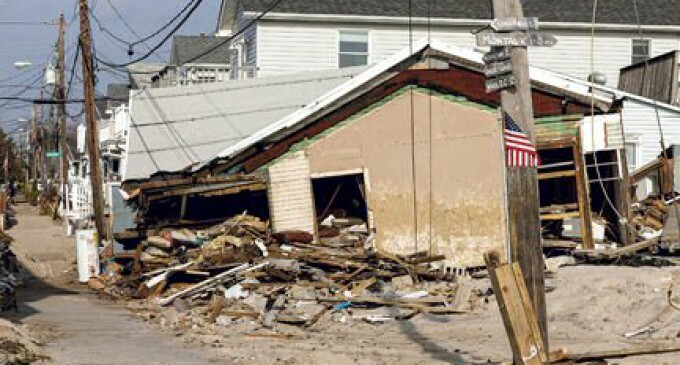 Before Sandy, building codes in certain flood-prone areas in New Jersey required the lowest floor of certain structures to be built one foot above the base flood elevation as determined by FEMA. Structures built before this requirement took effect were grandfathered into compliance but would have to be reconstructed in accordance with the elevation standard in the event of substantial damage to the structure. Risk of a constructive total loss and the potential need to rebuild to code—realities that exist apart from the specter of catastrophe—bring to the fore the importance of property owners carrying an adequate amount of insurance and the need to strongly consider purchasing OLC coverage. Replacement cost addresses the cost of replacing a building as it existed before loss, but doesn’t generally pay for compliance upgrades such as elevation, roof tie-downs, or electrical wiring improvements. Therefore, a policyholder who has purchased OLC is in a favorable position for a more substantial recovery. Of course, it’s important to recognize that even OLC has certain limitations. Traditional OLC forms typically respond to the impact of building codes in effect at the time of loss. That focus generally aligns well with the rebuilding process in the case of non-catastrophe losses—and catastrophe losses, as well—provided that strong modern building codes were in effect before the catastrophe. In many loss scenarios, the rebuilding period plays out against regulatory requirements consistent with those in effect when the loss occurred. Yet, some catastrophe situations bring another dimension to the loss tally. When a catastrophe strikes, the policyholder who has sustained a loss is invariably just one of many in an affected community. Leaders may seek to mitigate the potential consequences of future events, and that exercise may result in the promulgation of new and revised building code requirements during the period before rebuilding. On January 25, 2013, barely three months after Sandy struck and well before the rebuilding of most damaged and destroyed structures, the state of New Jersey adopted emergency amendments to its Flood Hazard Control Act. In part, the amendments addressed minimum flood elevations for buildings in certain counties, as issued by FEMA following Sandy. The amendments showed foresight in seeking to protect people and property from the effects of future storms. To those in the world of insurance, the reality of post-loss changes to building codes highlights an opportunity for enhancing coverage. As insurance products evolve to meet need and demand, we can anticipate enhancements to coverage offerings such as OLC, including, perhaps, providing coverage for the costs associated with certain aspects of post-loss building code changes. Building code compliance has impact beyond physical restoration. Rebuilding to code often extends the reconstruction timeline, increasing the amount of time a business is interrupted. Time-element insurance typically excludes the extended period of time attributable to building code upgrades, but a time-element version of OLC is an option, available in the marketplace, which offers another tool for putting together a comprehensive insurance package. New and enhanced insurance products emerge as new exposures take shape. In recent years, for example, demand surge has been recognized as another challenge in recovering from a catastrophe. The increased demand for labor and materials following a catastrophic event drives up the cost of rebuilding, creating situational underinsurance. A number of insurers now make available, through their commercial property programs, a relatively new optional coverage that provides an additional amount of insurance dedicated to the cost of demand surge. Insurance agents are in a unique position to educate both their clients and industry partners. Agent advocacy has had a tremendous and beneficial impact on the insurance industry. In fact, post-loss building code changes and demand surge are issues that have been spotlighted through the efforts of independent insurance agents. Loretta Newman, CPCU, is a principal in commercial property product development at ISO Solutions, a Verisk Analytics (Nasdaq:VRSK) business.